Part of the SSR Papers series. fies the factors that were conducive or constraining to the establishment of community policing in each case. 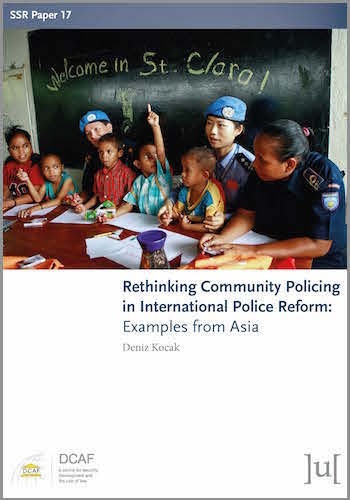 It concludes that basic elements of police professionalism and local ownership are necessary preconditions for successfully implementing community policing according to the principles of good SSG. Moreover, external initiatives for community policing must be more closely aligned to the realities of the local context. These are words or phrases in the text that have been automatically identified by the Named Entity Recognition and Disambiguation service, which provides Wikipedia ( ) and Wikidata ( ) links for these entities. This is an Open Access book distributed under the terms of the Creative Commons Attribution 4.0 license (unless stated otherwise), which permits unrestricted use, distribution and reproduction in any medium, provided the original work is properly cited. Copyright is retained by the author(s). The MARC Record for this book will be available shortly. This website is operated by Ubiquity Press Limited, a company registered in England and Wales with Company Number 06677886.